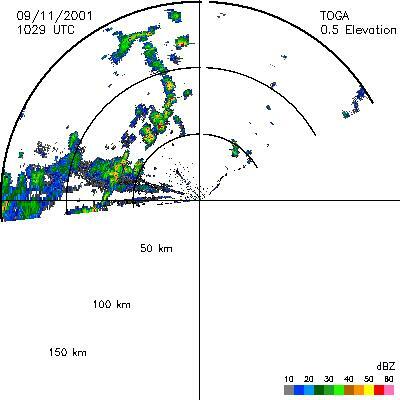 The TOGA radar dataset consists of browse and radar data collected from the TOGA radar during the CAMEX-4 experiment. TOGA is a C-band linear polarized doppler radar using 500KW of radiated power. Products available include real time PPI scans of reflectivities and Doppler velocities. Archived by National Aeronautics and Space Administration, U.S. Government, NASA/MSFC/GHRC. https://doi.org/10.5067/CAMEX-4/CBAND/DATA101. Gerlach, John and Paul A Kucera.2002. CAMEX-4 TOGA RADAR indicate subset used. Dataset available online from the NASA Global Hydrology Resource Center DAAC, Huntsville, Alabama, U.S.A. DOI: http://dx.doi.org/10.5067/CAMEX-4/CBAND/DATA101.